Institutional investors are forecasting the worst outlook for earnings and GDP growth since the financial crisis, that’s according to the latest issue of Bank of America Merrill Lynch’s Global Fund Manager Survey. A total of 177 institutional investors managing a combined total of $494 billion in assets responded to the survey between January 4th and January 10th. According to the responses, 60% of these investors expect global growth to weaken over the next 12 months, “the worst outlook on the global economy since July 2008, and now below the trough in January 2001,” the report notes. However, while more than half of the respondents expect global growth to week and over the next year, only 14% of 177 institutional investors who responded to the survey expect a global economic recession in 2019. Instead, investors are saying they expect secular stagnation in the next two to three quarters "rather than a global recession." As economic growth slows, respondents also expect a decline in inflation. Just 19% of investors who responded expect global CPI to rise over the next 12 months, that's down from a high of 82% in April last year. Against this backdrop, investors surveyed think the most significant risk to markets is corporate leverage. When asked how they thought companies should be using cash flow, 50% of respondents said businesses should be using cash flow to improve balance sheets, the highest percentage since September 2008. Only 13% said companies should increase shareholder returns. To prepare for the upcoming stagnation, the institutions surveyed are rotating from equities into bonds, and selling cyclical value "via industrials." Investors are now overweight cash, REITs and healthcare stocks. They are short UK and European stocks as well as industrial equities. The average cash balance of funds has increased to 4.9%, from 4.8% at the end of 2018, that's compared to the 10-year average of 4.5%. This weighing gives a BofAML Bull & Bear indicator reading of 2.1, just above "buy" territory. The Bull & Bear indicator works as follows: "When average cash balance rises above 4.5%, a contrarian buy signal is generated for equities. When the cash balance falls below 3.5%, a contrarian sell signal is generated." 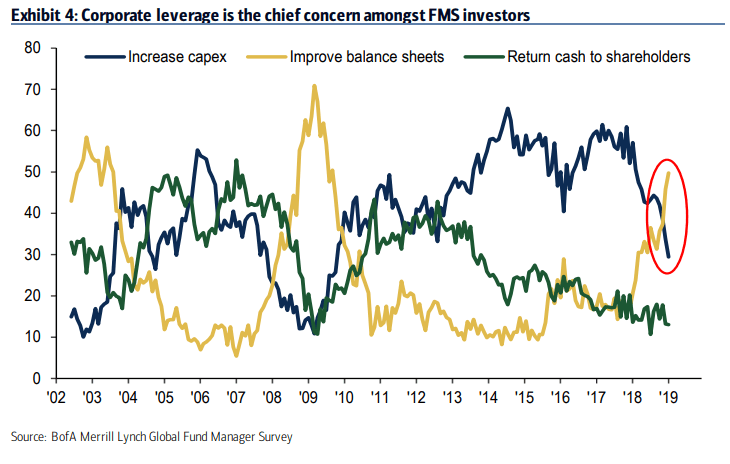 Other notable takeaways from the survey include the reading that hedge fund respondents say their gross assets to capital ratio has now fallen below 1 for the first time since 2010, implying they have reduced leverage significantly over the past 24 months. 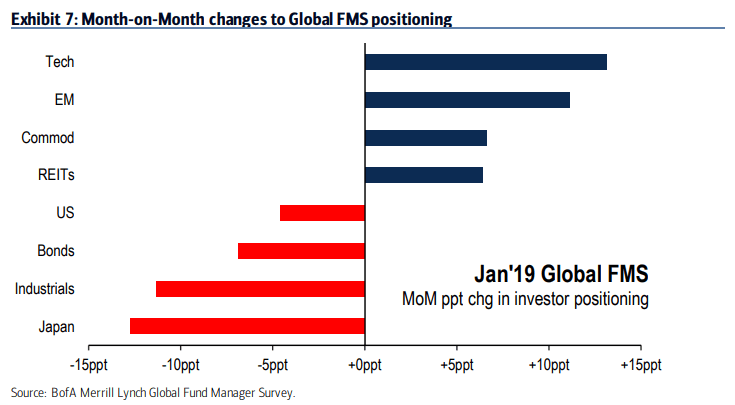 Meanwhile, institutional investors still think the trade war is the most significant tail risk for markets, and long US dollar is the most crowded trade on the market at the moment.